Every couple fights. Period. End of sentence. If you’re not disagreeing from time to time, your relationship is probably not as alive as it could be. But that’s a topic for another day. The trouble most couples get into is not the fight itself, it’s the repair. Picture this. You and your partner get into a disagreement about what to do this weekend. One of you wants to lay low and one of you wants to go out on the town (whatever that antiquated statement means to you). You’re not able to come to an agreement. There’s some name calling. Some slammed doors. Feelings are hurt and each of you withdraws into your own corner to lick your wounds. We’ve already established that. The main difference between couples who thrive and those who struggle is that the couples who thrive know how to repair. Sure, all couples fight, but those that know how to repair or make-up will use fights to make their relationship stronger and more connected. They will be able to be more vulnerable with each other. This is a common thing I hear from couples I work with. Whether because of ego, toxic masculinity or pain, they want their partner to make the first move. Well if both people wait for the other person to go first, that could be a very long standoff. If you wait for your partner to make the first move, you both lose. It doesn’t matter who started the fight, either of you can end it. You can start with I’m sorry. What you say is not typically as important as how you say it. After you’ve had a moment to calm down, reach out to you partner and let them know you’re ready to move forward. Check in with them and see if they’re in a good headspace to have a conversation about the fight. What do I mean by a healing conversation? This is a generic term for a conversation that addresses the pain caused by the fight and uses the pain to bring you closer together. There is no one size fits all approach to a healing conversation, but there are some principles that you can use to help guide you in coming back together after a fight. If the fight is around something bigger like a betrayal, it may require more than one conversation. Think about the scenario mentioned above where a couple has different plans for their shared weekend. Imagine that the conversation devolved into accusations, blame and criticism. Voices were raised and some unkind things were said. Sure, one person started the escalation, but in the end both lose out. If you’re ready to repair, here are some principles to keep in mind during the process. Make sure you’re inside your window of tolerance. This is a term used by neuroscience researcher Dan Siegel to describe the optimal zone in which we can tolerate having difficult conversations. If you picture tolerance on a bell curve, the window of tolerance is the middle zone when you’re not too overwhelmed or checked out and you can stay engaged with your partner. This zone is different for each of us and if you’re outside your zone, that a sign you should take a time-out and calm yourself down. Check in with your partner. Once you make sure you’re in your window of tolerance, check in with your partner to see if they’re ready to talk about the fight yet. If either one of you is outside the zone, it’s pointless to try and have a healing conversation at that time. Everybody’s different and while it may take you fifteen minutes to cool off, your partner may need a few hours. You both need to be ready to repair for it to work. Take responsibility for your part in it. After you’ve had some time to cool down and get into the window of tolerance, think about your part in the argument. Chances are, there’s something you did to either start or intensify the fight. If you can own your part in it, that’s a great place to start a healing conversation. 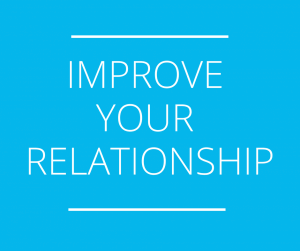 Ask your partner what they need to hear in order to move forward. If you start off the conversation by taking responsibility for your part in it, you can then check in with your partner and ask exactly what they need to hear to move forward. 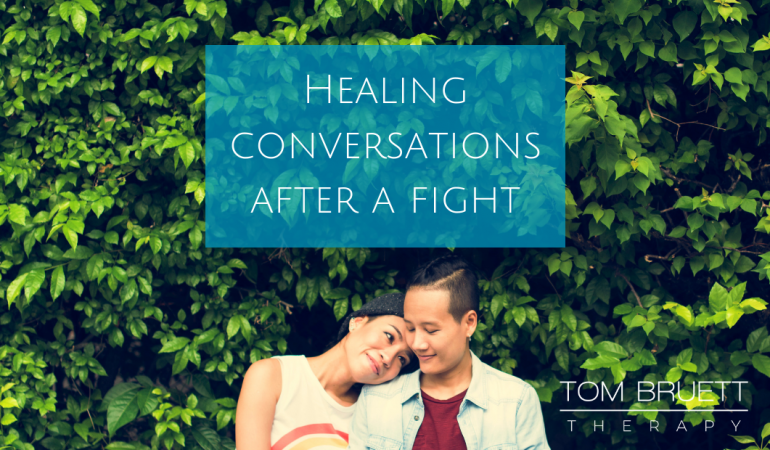 They probably have a vastly different experience of the fight than you, but by checking in on exactly what they need to hear you can focus the healing conversation. Repeat exactly what your partner said they need to hear. Even if you disagree with what your partner is asking for, say it anyway. You don’t have to believe it 100 percent, but as long as what they’re asking for is reasonable, just practice saying what they need to hear. The purpose of this is to become really clear about what was at the bottom of the disagreement for each of you. Then tell your partner what you need to hear. Now that you’ve attended to your partner’s needs, get clear about what you need to hear to have the conversation be healing on your end. Try not to attack or blame your partner, but explain what was hurtful from your perspective and ask for what you need. Share your differences as a way to better understand yourself and them. Chances are you and your partner will have had different perspectives, needs and wants from the fight. Instead of using differences to divide you, use them to help bring you closer together. If you get stuck anywhere in this process, find a couples therapist to help you out. Most of us were not taught how to repair fights in a healing way. Heck, most of us did not have the best examples of what good relationships can be like. Sure, there is a stigma around seeking mental healthcare, but your relationship is worth it. Remember, a divorce or break-up is much more painful and expensive than seeing a couples counselor. ← How does social anxiety affect gay men?